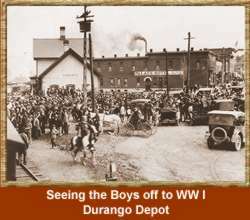 The City of Durango was founded by the Denver & Rio Grande Railway in 1880. The railroad arrived in Durango on August 5, 1881, and construction on the line to Silverton began in the fall of the same year. By July of 1882, only 11 months after construction began, the tracks to Silverton were completed and the train began hauling both passengers and freight. From the very beginning, the railroad was promoted as a scenic route for passenger service, although the line was constructed primarily to haul mine ores, both gold and silver, from the San Juan Mountains. It is estimated that over $300 million in precious metals has been transported over this route. 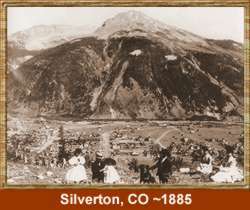 By 1885, the population of Silverton had grown to 1100 and Otto Mears completed the toll road to Ouray, and additional narrow gauge track out of Silverton was laid down in 1887. In 1893, 10 large mines in the Silverton district were forced to close when silver prices dropped from $1.05/oz to $.63/oz; just three years later, the Yankee Girl and Guston Mines played out. 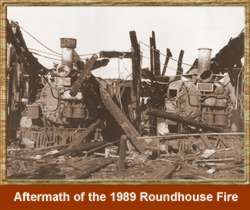 In Durango, the fire of 1889 virtually destroyed downtown and the first automobile arrived by train in 1902. By 1906, Mesa Verde was designated a National Park increasing the potential for tourism promotions. Throughout the next twenty years the railroad faced many challenges; slides, floods, snow, war, and financial instability. When the United States entered WW I, the government assumed operation of the railroad. Shortly after resuming control of railroad operations, the D&RGW reorganized due to financial difficulties. Silverton suffered devastating effects from the Spanish Flu Epidemic of 1918 - 10 percent of the population died in just six weeks! In addition, the Gold King Mine closed, the Sunnyside Mine temporarily ceased operations for almost ten years and the Silverton Railroad closed. With the start of WW II, the US Government requisitioned narrow gauge equipment to use in Alaska, and the smelter in Durango reopened to process uranium for use in the war; the smelter continued to process uranium instead of silver into the late 1940's due to the Cold War. By 1947, the Silverton branch was in danger of being abandoned; but a determined staff stepped in and helped to promote tourism, keeping the line alive. When Hollywood discovered Durango and the railroad, several movies showcasing the train were filmed in the area over the next ten years: Ticket to Tomahawk, Across the Wide Missouri, Denver & Rio Grande, Viva Zapata and Around the World in 80 Days. Silverton branch and with the restoration process complete, Engine #481 returned to service after 20 years in retirement. Throughout the 1980's, the D&SNGRR continued to build on the scenic tourist railroad industry. 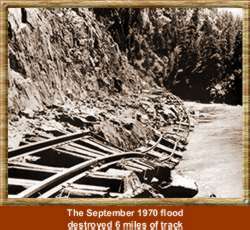 Engines and coaches began to be weatherized for winter use; a third train to Silverton was added to the schedule along with an alternative fourth train to Cascade Canyon Wye; major track reconstruction occurred as nearly ten thousand ties were replaced. Locomotives #497 and #480 were restored and returned to service, the #497 being the only K-37 to run on the line, and the innovative RailCamp was built for use in the summer. In 1985, the D&SNGRR purchased the Silverton Depot, returning it to service. By 1986 there were four trains running to Silverton with a fifth running to Cascade Canyon Wye! 118 years later, the Durango & Silverton Narrow Gauge Railroad continues to provide year-round train service, operating a historical train with rolling stock indigenous to the line. The locomotives used to pull today’s train remain 100% coal-fired and steam-operated; the locomotives are 1923-25 vintage and are maintained in original condition. The coaches each feature bathroom facilities and are heated during the winter months for passenger comfort, and open gondola cars provide a panoramic view of the mountains. Concessions, snacks and beverages are available on every train.